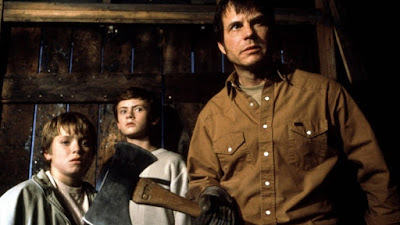 To pay my respects to the late, great Bill Paxton, who passed away Saturday at the ridiculously young age of 61, I am reprinting here my original 2002 review of his feature film directorial debut, the criminally under-rated Frailty. You might not immediately recall his name, but you almost certainly would recognize Bill Paxton for his solid and unassuming performances in Apollo 13, Titanic, A Simple Plan and Twister. Chances are good, however, that Paxton will become far better known as a filmmaker if enough people see Frailty, a directorial debut that is not merely promising but highly accomplished. Evidencing the same uncomplicated, matter-of-fact naturalism that informs his best work on the other side of the camera, Paxton tells a complex and compelling story in frills-free, straightforward style that only serves to intensify the movie’s steadily escalating suspense and clammy sense of impending doom. And he’s smart enough to cast a first-rate actor – himself – in a demanding role that calls for a delicate balance of homespun charisma and soft-spoken insanity. Frailty is, at heart, a horror movie, but almost all of the violence occurs off camera, and the chief bogeyman is all too human and, at times, almost perversely plausible and sympathetic. To its considerable credit, the film gets more mileage from the power of suggestion than any thriller since The Blair Witch Project. Better still, the camerawork is a lot less vertigo-inducing here. So go see it, and have a great time. I’ll just sign off now and…. Oh. You want to know more, do you? Well, I was afraid of that. You see, Frailty may be a fine movie to watch, but it’s terribly tricky to review. For one thing, I have to be very careful not to give away, or indirectly suggest, the jaw-dropping, mind-blowing plot twist. Come to think of it, even warning that there is such a switcheroo may be telling you too much. I guess it’s safe to tell you that most of the narrative is related in flashback – appropriately enough, on a dark and stormy night – as a seriously spooked-out fellow named Fenton Meiks (Matthew McConaughey) explains to a Dallas-based FBI agent (Powers Boothe) how his recently deceased younger brother grew up to be a most-wanted serial killer. Evidently, young Adam Meiks (Jeremy Sumpter) learned his lesson well while observing his father (Paxton), a sweet-tempered mechanic and loving father who occasionally slaughtered folks with a well-aimed swing of his trusty axe. Don’t misunderstand: Dear old Dad wasn’t your everyday, plain-vanilla psychotic killer. In the flashbacks, we see that Dad sincerely believes he is doing the Lord’s work – indeed, is following God’s personally delivered orders – by slaying “demons” who walk the world undetected by lesser mortals. Young Fenton (played in flashbacks by Matt O’Leary) begs to differ, and warns his zealous father that, hey, murder is murder, no matter how demonic you think your victim might be. Not surprisingly, Fenton suffers dearly for offering this perfectly reasonable advice. To save himself, he must pretend to accept the notion that the family that preys together stays together. Nothing good comes of this. OK, that’s all I can tell you about the plot. Actually I’ve told you one or two things that aren’t entirely true, but you’re supposed to accept them as the real deal until Paxton pulls the rug, and then the floorboards, out from under you. Frailty may remind you of The Night of the Hunter (or even To Kill a Mockingbird) in its ability to sustain a frightened child’s point of view. It definitely will leave you stunned and breathless, and perhaps fully prepared to argue with friends and total strangers about the meaning of the final scenes. Have fun. Every movie he was in was awesome.